I feel like I'm totally failing as a nail blogger right now. Most bloggers are pulling out all the holiday/Christmas/Hanukkah stops and I've only managed two snowflake manis this year. I don't know what it is about this season, but I'm not feeling all that festive. I'm not all bah humbug about Christmas, but I think the number of holiday/seasonal manis will be fairly limited this time around. Do you guys remember that time I finished all of my untrieds? I got busy/started shopping again and ended up with a mini untried stash. Instead of letting it get out of hand, I decided to make a point of using at least one untried per mani. Today's untried of the day is Powder Perfect Horus. If you've been with me for a while you might have seen my post about Powder Perfect at Cocktails and Colors 2016, and my review of Powder Perfect Heka (also from the Egyptology Collection). If not, be sure to click those links to check them out. The Egyptology Collection was so much fun that I had to pick up some additional shades during Powder Perfect's Black Friday sale. I'm really digging micro glitters right now, so Horus seemed like an excellent choice. While this is a great fit for Christmas, I definitely see myself pulling it out again for Valentine's Day. I don't want to get into a full review of Powder Perfect Horus, but my feelings mirror my review of Heka. This shade applies evenly and wears well. My swatches show two thin coats. 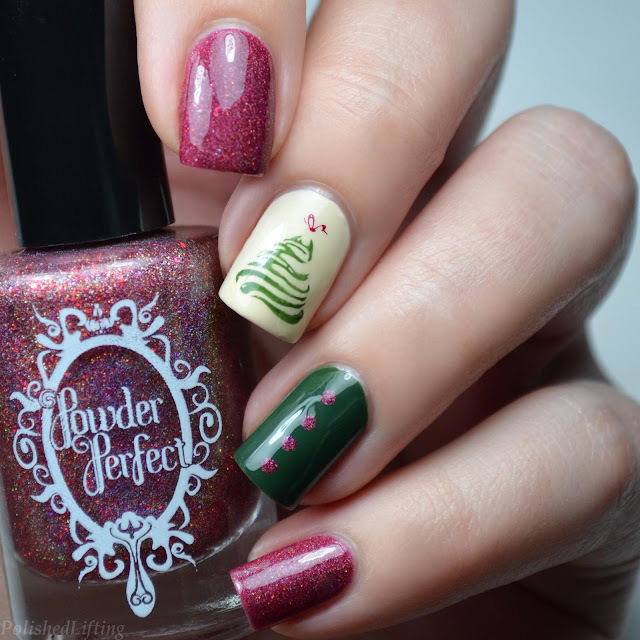 Will you be doing any holiday themed manis this winter?